The trip starts with drive from Kathmandu through the friendship bridge. After completion of the immigration formalities at Zhangmu we drive to Nyalam, the first night. 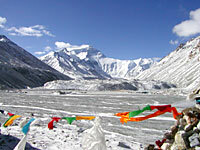 Next day we continue drive to Old Tingri and start trekking to North Everest Base Camp. The trek will follow the historic expedition route from Old Tingri to Rongbuk crossing over the Langma La pass-16,900 feet. Following the route to North Everest Base Camp you will have enough time to explore the Rongbuk glacier, Chomolangma Base camp, below the massive north-face of Mt. Everest. After having the magnificent views of worlds highest mountain scenery you will be back to Kathmandu. The trek portion will be supported by a expert Nepalese Sherpa team. Our professional chef will prepare all meals and other field staff will take care of camping and transport to the supplies (camping /kitchen materials and luggage) for which we use yaks and/or truck. Transportation by Land cruiser and necessary support vehicles.